I have had SmartThings for about 3 months now and have about 10-15 different switches and sensors hooked up to it. I also have an August lock and doorbell, 4 Arlo cameras, a Nest thermostat, Harmony hub and Elite remote, and an echo. I have been reading the forums since I got the smart things hub but there are a few things that I just can’t seem to figure out. Everyone keeps talking about CoRE and different smartapps for it. How do I get this? I am thinking that this might help get my nest onto smartthings and maybe even allow me to check status of devices through the echo. Can someone explain to me how to take the next step with smarthings…thanks!!! My next step would be to get the Ask Alexa app up and running. It’s not too complicated just involved but incredibly well written up step by step guide. Maybe use this for your Nest stuff. CoRE is a smart app. It allows you to do more than alot of the standard smart app in term of controlling what happens when something is seen by the hub. I was able to get Nest Manager up and going along with doing a couple of other things through the IDE such as creating some new “Device Handlers” and “Device Types”. I do not have an actual computer so it is difficult to get CoRE up and running without one. Plus the guide is slightly lacking for a newb such as myself. I have dual gang switchs in each bedroom (3 total). Currently one of the switches controls the fan and one switch controls an outlet. The light on the fan I have to manually pull a chain to turn on. I was going to use the below switch and receiver to be able to control the fan and light from one switch, but this does not give me smarthome control over the fan and the light. Create a whole new level of comfort in your room by installing Lutron Maestro Single-Pole Combination Fan and Light Control. What I would like to do is use that switch in conjunction with 2 micro dimmers/switches so that I have the switch to turn everything on and off manually and also automation capabilities. Has anybody seen these? Or might anyone know if I could maybe hook up the micro dimmer to the receiver in the fan control box? I am still a little confused on how the micro dimmer works with standard switches, enabling both manual control and smart control. Maybe some insight as to how that works would be helpful. I’m tired today, so I’m going to let other people answer your questions about the micros, but I just wanted to mention that it is possible to use one of the Lutron combo fan/light single gang switches that uses IR in a smart setup By also adding your Logitech Harmony hub into the mix. 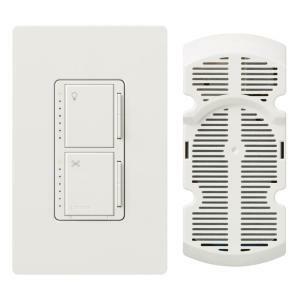 The harmony can then control the Lutron wall switch, the Lutron wall switch controls the fan controller bridge in the fan canopy – – and smartthings can talk to the harmony. This is an expensive option, but it does work. However, it has to be a Lutron model that can work with the harmony, and not all do. Oh and if you use an IR remote solution, including the harmony, you don’t get status back to smartthings if someone just uses the wall switch. That might or might not matter to you. If it does matter, then you’re better off looking at the solutions with the micros. Hi all, Is there a device that allows me to control a 3-speed ceiling fan with a dimmable light kit? Right now I have an inwall switch like this: http://www.lowes.com/pd_69955-539-S2-LFSQH-WH___?productId=3189443&pl=1&Ntt=fan+and+light+switch which i am trying to replace. Thanks! Sorry I can’t be more specific, but that should be enough to get you started and I’m sure other people will be able to help.